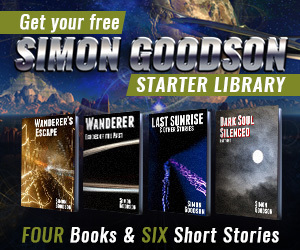 I’ve been hard at work on the fourth book in the Wanderer’s Odyssey series and it’s now over 55,000 words. Judging by book three and by what I still have to pack in that means it’s probably around halfway done, maybe a little less. I’m having a great time writing it and I love the way the story is developing. As always, it’s really frustrating not being able to talk to anyone about any of this, or about the ideas I have for a title. I guess I’ll have to get writing order doxycycline canada faster and complete it. One thing I can confirm now is that there will be a book five. There’s far too much to pack into a single book, but don’t worry – book four will be complete within itself and shouldn’t leave you on quite such a cliffhanger as book three did. Oh all right… I can let one detail slip… Jess and the Wanderer do reach the Wanderer‘s home system in book four. And when they do… nah. That’s your lot until you read the book! I just finished the third book in the Wanderer series and I loved it. At any given time while reading the book, I had no idea where the story was going to go and it didn’t arrive where I expected it to. I believe this was the best book so far in the series. Oh, and the Tainted are like the Borg and Alien combined…simply horrific! Well done! Glad to hear you enjoyed it so much. Book four is going to have even more packed into it, and without giving too much away there’s lots more to learn about the Taint and the universe as a whole. Am loving the series so far! Cannot wait till the 4th and 5th books come out.. Which brings me to the question, when will the 4th book be out in e-format? And how long till the 5th book is out? Thanks for getting in touch. It’s hard to say exactly – one advantage of being an Indie author is not having a finished book sitting waiting for months or even years to be published. As soon as it’s ready I can publish it, but that does mean estimating the release date is a lot harder. As things stand it may be out in December or January but that depends greatly on just how long the book ends up being. I’ll post updates here regularly. As for book five… well, it will be the next book I work on so at a very, very rough guess it will be sometime between Spring and Autumn 2015. But that’s a very rough estimate.